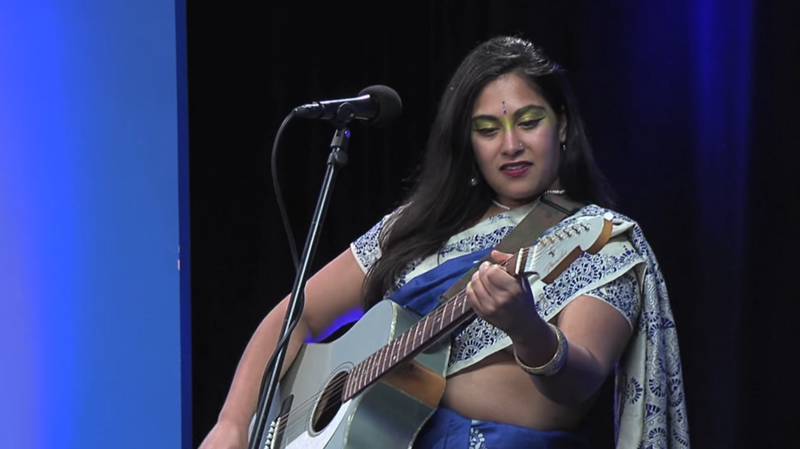 Born and bred in Michigan to Bengali parents, Saraswathi Jones grew up with a heavy presence of Bengali, Bollywood, and other South Asian music in the house. She also learned the violin from a young age, which piqued her interest in music. I get it — it’s vague because there isn’t anything like it that exists, already, at least in a South Asian context. “I don’t think I’m doing anything new, though,” she says. In her own view, Saraswathi Jones extends a historical Western audience and musical tradition, as well as the tradition of South Asian folk music, to make a little room for diaspora. As in this music video, her music often blends her South Asian culture with her American upbringing, and she’s self-aware — diaspora music that we need. Even her chosen stage name brings Saraswathi, Hindu Goddess of knowledge, music, arts, and learning, to Jones, a nondescript Western name. And while there may have been other reasons for her choosing the name Jones, the point remains. South Asians in Western spaces sometimes exist as juxtapositions like that. This, South Asian combined with Western music, isn’t new in and of itself– South Asian musicians from the homelands to diaspora musicians and South Asian YouTubers have been creating this kind of music for a while now (sometimes as a joke, too). The difference, of course, is when that space is made in something as tied to home as folk music. Country music and Bengali folk music have both been huge influences for Saraswathi Jones. Both revel in a kind of linkage to a geographical point and are rooted in the places they are produced. Music has the ability to traverse those geographies, often, but these two genres specifically engage in a nostalgia about their distinct homelands. The children of immigrants in diaspora, however, are still figuring out and uncertain about home. For where should we be nostalgic? The poet Shailja Patel often writes about how immigrants love country music. Country music begs for a recognition of home, and is an example of odic memories of a person’s upbringing. And perhaps that’s why Saraswathi Jones’ music is so striking, particularly when it blends these distinct musics of belonging to a place together. Her lyrics for Red Clay ask, “Take me back / Across the ocean” because, really, across both oceans there is a home — that’s the paradox of diaspora — which makes it hard to know which home we belong to. Her song “Mother Tongue” immediately picks up the cadence of country music while implementing Bengali lyrics, to reference another place and language. “Don’t lose your mother tongue” she sings, in English, Bengali, and a myriad of other languages. A myriad of mother tongues. For diaspora, often the homes we get to grow up in reject us, but we’re also unable to fully perceive where our parents grew up. The inherited nostalgia, then, is maybe a symptom of the otherness we feel here — and maybe South Asia is sometimes a simple answer for feeling less rejected. So when Saraswathi Jones wears a sari and holds an electric guitar, singing about a home neither of us have lived in, it disrupts that rejection, making it visible and heard. What, then, do we make of this paradox Diaspora music can exist in, where folk music is redesigned to refer to multiple geographies at once? For the time being, it can look like a woman in a sari on a Massachusetts shore, asking, “Show me how to be near me” somewhere, at least.